Sega Genesis/Megadrive and Sega CD/Mega CD emulator for Caanoo. The last version adds the support to the Master System and the 32X add-on (the emulation is still incomplete). One of the best emulators for the GPH handhelds! Works perfectly in the games folder. how do you compress megacd files? Sega Master and 32X!?!?! WAHHH!!! Bring this to the Wiz too! Whahahaha! Thank you! Works more than full frame in the Caanoo, it's kinda funny to play with the analogue stick, streets of rage and such. Haven't tried the 32x or megaCD yet but the md/sms are awesome. This is absolutely superb. The emulation is top notch. As good as Kega Fusion for the P.C. This is what I bought my Caanoo for. I'm making a donation thanks to this emulator. More please. Y E S. Thank you GOD! AlexKidd2x just exploded into bits - I can finally play SMS/GG games FULL SCREEN, with NO TEARING on my Wiz system. I'm thoroughly impressed! fINALLY THEY GOT IT RIGHT NOW IF ONLY THE gB OR NES OR THE SNES WERE THIS GOOD? This is a great emulator. Both the Genesis and Sega CD run excellent. Cant seem to run Superleague baseball or Winning post on MegaCD or NHL 96, 97, or 98 on Megadrive. 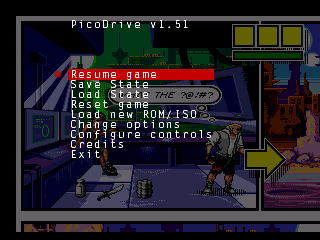 I've discovered that Pico Drive does not work with TV-out. An update is required. Anybody else notice the exploit virus that comes with this deal? Emu runs great by the way. Seconded on Pico Drive not working with TV out. An update would be most appreciated. you can use a USB joypad for player 2, but the input conflicts that of the cannoo, can you fix this? @Coolotail: Picodrive automatically binds all new joysticks to player one, you have to manually unbind them from Player 1. Also Gmenu2X can bypass the TV-out problems. Haven't found a game that doesn't run perfect on this emulator. Tried a few Sega CD games, also work perfect. (Ecco CD, worth it for the soundtrack and extra levels). where do I load a sega cd and whats the file extension?